Marietta, Ohio: Antique Publications. Good with no dust jacket. 1991. First Edition. Hardcover. 091541077x . Hardcover, no dustjacket. Very good interior, with good minus cover. Ex-library book with the usual ex-lib type of markings. Pages are all intact and very clean. Cover has scuffing, ink rubbing and moderate wear to edges/corners with some paper loss at a few corners. Colour & b/w illustrations. A comprehensive guide to this unique collectible glassware. (700,0514) ; 4to 11" - 13" tall; 111 pages . U. K.: Ward Lock Ltd. Very Good. 1996. First Edition. Softcover. 0706374681 . Ex-library book, but still in very nice condition - sturdy laminated cover and usual ex-lib type of markings. Pages are clean and intact, light soiling to outer edge of pages. Cover has light scuffing. Colour & b/w illustrations. ; Practical Home Restoration; 8vo 8" - 9" tall; 96 pages; One in a series dealing with techniques for home restoration, this book provides practical information to improve the home, with step-by-step projects and tips on short-cuts. 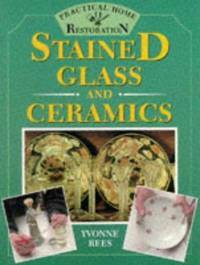 The book also contains descriptions of unusual techniques and antique styles, with ideas for livening up everyday objects, concentrating on ceramics and stained glass. It shows the correct techniques for restoring and repairing items as varied as stained glass windows, ceramic dishes and antique china dolls. (295osl, 0811) . North Light Books. Very Good+. 2000. First Edition. Softcover. 1581800797 . Ex-library book, but still in excellent condition - laminated cover and usual ex-lib type markings. Pages are clean and tight, a little soiling to outer edge of pages. Cover has light wear to laminate at corners. Profusely illustrated in colour. ; 4to 11" - 13" tall; 128 pages; From a Reviewer: "Excellent Information and Great Projects! 5 Star Plus! ...I really have enjoyed this book! I am not what I would consider an artist and I needed something I could do easily at home. This book gave me all the information I needed to know about all the paints on the market, and all of the relevant tools I needed - making it very easy to shop, and there was a project that worked with each of the paints. The projects are great, they are not cheesy like some other books I have but, rather they are elegant, classic, tasteful and easy to duplicate. You will find lots of great ideas and I found the book easy to follow, inspiring, full of very useful information, and something fun I can handle. As the author, Carin Heiden Atkins, says something like this in her introduction - leave your worries at the door, sit back, play your favorite music, and have a great time. You really can do this. I have recommended this book to many friends and I whole heartedly recommend this book to you. " . Dover Publications. Good. 1972. First Edition. Softcover. 0486228126 . Ex-library book with sturdy laminated cover and usual ex-lib type markings. Internal pages tight and clean other than light stain affecting bottom corner of last section of pages, and light soiling outer edge of pages. Cover has light edgewear to laminate. Illustrated. 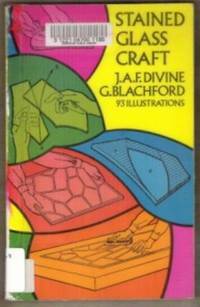 Covers various aspects of stained glass craft including a summary of processes, design, cutting, waxing, leading, soldering, painting on glass, etching, equipment & tools etc. ; 8vo 8" - 9" tall; 115 pages; (*lower shipping avail to most locations) [227-osl] . Chilton Book Co. Very Good. 1974. First Edition. Hardcover. 0801958393 . Chilton Books 1974 edition, same ISBN. Very good ex-library book, usual ex-lib type markings and brodart cover. Pages are intact and clean other than a small amount of pencil underlining. B/w & colour illustrations. Cover has light scuffing, light soiling, a little spotting to outer edge of pages. 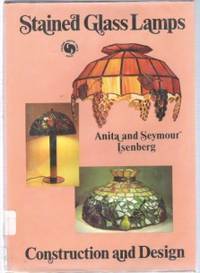 Complete directions for designing and constructing stained glass lamps. Explores all basic tools, techniques and procedures - from swags & lanterns to Tiffanies. ; 4to 11" - 13" tall; 222 pages . Quarry Books. Very Good+. 2000. First Edition. Softcover. 1564967131 . Great condition, clean and tight. Library binding with sturdy laminated cover & usual type markings. Interior pages clean. Cover has very light edgewear & a little scuffing to laminate. "For crafters and artists, painting on glass has become a very creative field. DeSimone's method is new, using a variety of rubber-tipped tools called color shapers available at craft stores. 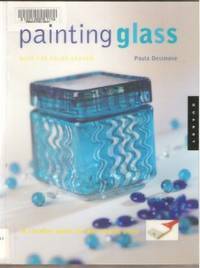 Once applied to the glass, the wet paint is patterned and manipulated using a variety of color shapers. 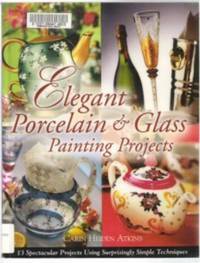 Twelve glass projects include bowls, candy dishes, decanters, and platters...." [osl? -460] ; 8vo . Future Crafts Today. Good+. 1976. First Edition. Softcover. Oblong (8 x 11"). Ex-library with laminated cover & usual markings. Light wear & creasing to cover, pages tight, occasional wrinkling. Colour illus. 48 pages. Covers history, tools, stained glass, colour & design, the cartoon, making the pattern, cutting stained glass, leading, soldering lead came, copper foil techqnique etc. (**lower shipping available to most locations) ; 8vo 8" - 9" tall . Save 10% on Every Purchase! Copyright © 2000-2019 Biblio, Inc. All Rights Reserved.